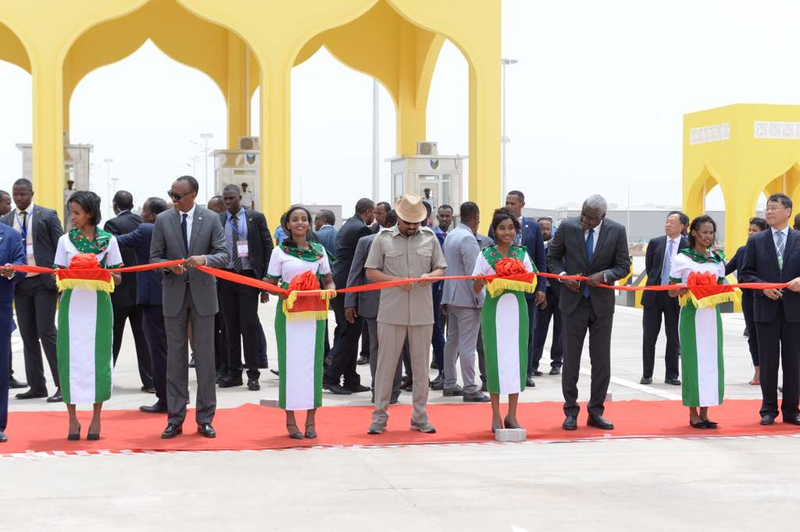 At the opening ceremony of a 370-million, 240-hectare international free trade zone in Djibouti, Thursday, Presidents, prominent African, Asian business leaders, and representatives of UN, AU and other international organizations attended. Abdirashid Duale, Dahabshiil Group CEO, was among the luminaries who graced the Djibouti International Free Trade Zone (DIFTZ) launching event, and the Africa-China Economic Forum and Exhibition which followed on Friday. Amina Hersi Moghe, an East African business mogul, was another. Mr. Duale spoke to the press on site and, later, to the BBC Somali Service about the events. “Availing this crucial facility to Africa is yet another portal connecting African business not only to China but, potentially, to international trade volumes,” he said, adding that Djibouti is strategically located at a command point to benefit from a number of trade routes traversing the area – land and sea. Duale believes that without the sound vision of the Djibouti government and its leaders, Djibouti would not have turned the epicenter hub of trade it has become now. The Djibouti International Trade Free Zone (DITFZ) was yet another manifestation of how important this tiny African country was becoming to Africa and the outside world, commanding attention. “The DITFZ would bring the world to Africa, as it will market Africa products and services to the outside world – providing a two-way channel,” he said. “I am happy to see an end to the difficulties the bulk of African business concerns and smaller firms/enterprises encountered in order to directly deal with big markets like that of China, and vice versa,” Mr. Duale said. He pointed out that, with the recent inauguration of railway facilities with landlocked Ethiopia and the network of land, air and sea facilities currently in place in Djibouti, supplying the rest of the continent and, in a similar fashion, accommodating goods African manufacturers and service providers are exporting, is much boosted by the DIFTZ vision, connecting Africa to global trade routes. Mr. Duale reaffirmed that Dahabshiil Group of companies, and, specifically, its East African Bank and Dahabshiil money transfer network, available in Djibouti, would further extend their services to facilitate trade among partners – large or small. “Dahabshiil is poised as a strategic financial services provider that can facilitate easy communication and money flow among business partners using its extensive experience and steadfast networking,” he stated. The DIFTZ would eventually spend some 3.5 billion US Dollars to extend facilities begun to cover 4800 hectares seeking to turn Djibouti to host Africa’s ‘biggest trade zone”. Djibouti plans to capitalize on its strategic position along one of the world’s busiest trade routes in order to further ‘consolidate its place in international trade and commerce’, as President Ismail Omar Ghuelleh put it, opening Friday’s Africa-China Economic Infrastructure Cooperation Forum and exhibition which closely followed on the heels of the DIFTZ event. Mr. Tegegnework Gettu, United Nations Under-Secretary-General and UNDP Associate Administrator, had a message for the Africa-China Sustainable Cooperation on Economic Structural Transformation, speaking at Thursday’s opening ceremony, officiated by Hon. Mustafa Kamil, the Djibouti Prime Minister. “Structural transformation and diversification is also crucial to build resilience to shocks, be it those driven by commodity price volatility, by natural hazards like droughts, conflict and instability, or epidemics such as Ebola. Diversification away from agriculture and from primary commodities is a buffer against these shocks and an effective way of mitigating these risks,” he said. Mr. Gettu further hoped that economic structural transformation and industrializationbe a “key to bring people out, and to keep them out, of poverty”. The DIFTZ launch event was attended by president Paul Kagame, president of Rwanda and, presently, the Chairperson of the African Union; Omar Hassan El Basher, the president of Sudan; Mohamed Abdillahi Mohamed Farmajo, the president of Federal Somalia; Abiy Ahmed, the prime minister of Ethiopia; and Moussa Fakki Mahamat, the Chairperson of the African Union Commission. The African leaders all heartily welcomed the DIFTZ promising to stand by it in every which required to make it a success. The DIFTZ was made possible by Djibouti, the majority shareholder, along with three Chinese companies: the China Merchants Group, Dalian Port Authority and Chinese big data company IZP.